High Ring Grackle with Sheepskin Covered Nose Pad. Stephen’s High Ring Grackle is a well-balanced noseband which doesn’t impede the airways or interfere with the bit even though it closes the mouth. It is a versatile piece of equipment, which makes it fit well. Looks tidy and can be used for the dressage phase of a one or three day event. 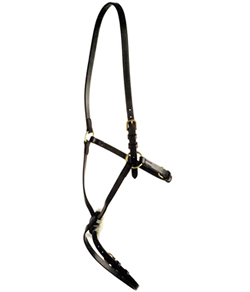 Furthermore, click here for the rest of our Bridles and Components. Full size or Cob – Black or Chestnut leather available.